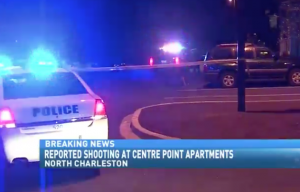 Shooting Injures 1 at North Charleston Apartment Complex; Justice Available to the Victim? Security measures are under scrutiny following a shooting at a North Charleston, South Carolina apartment complex Wednesday night, February 6, 2019. What security measures, such as gated-entry, fencing, visible surveillance cameras, and security patrols, were in place to deter crime and protect the victims at the time of the shooting?